Prunes have such a bad rap that, in 2000, plum growers got permission from the Food and Drug Administration (FDA) to market their fruit “dried plums” instead of “prunes.” It makes sense: How appetizing can a fruit be when it conjures images of wrinkled fingers after a too-long, too-hot bath or a grandparent padding to the bathroom? But the sweet, chewy, wrinkly truth is that prunes—or dried plums, if you want—are little nutrient and fiber bombs. A serving size of five prunes clocks in at under 100 calories, can help quell appetite, and packs a punch of healthful components. “When eaten frequently, prunes contribute to the overall intake of dietary fiber and many important vitamins, minerals, and phenolic compounds, which function as antioxidants,” Patricia Bannan, MS, RDN, says. Need more reasons to get prunes into your grocery cart? What are the health benefits of prunes? 1. Prunes help you maintain healthy digestion. Yep, we’re confirming the old wives’ tale that prunes can help get things moving. The fruit contains two things that help you go number two: fiber and sorbitol. Per the United States Department of Agriculture (USDA), prunes contain 3 grams of fiber. That’s almost 10 percent of the daily recommended value, 25 to 30 grams of fiber. Half of that is insoluble fiber, Bannan says, and it helps food move through the digestive tract faster to improve regularity. Let’s talk sorbitol, a sugar-based alcohol. You might recognize it as a sugar substitute lurking in the ingredient lists of things like diet sodas and chewing gum, but it’s naturally found in prunes. 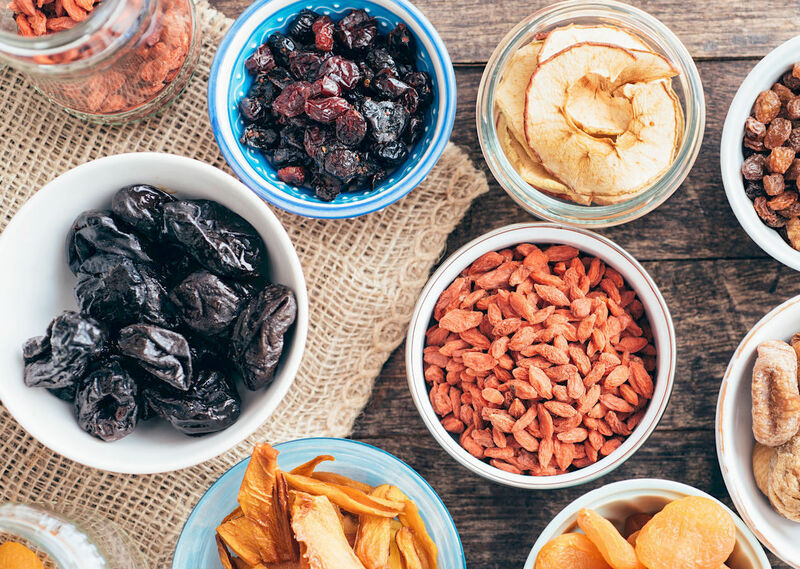 Amy Gorin, MS, RDN, and owner of New York City area-based Amy Gorin Nutrition, says the sorbitol (and fiber) found in prunes is said to have a mild laxative effect. “It helps stimulate digestion by helping to move water into the large intestine,” she says. While prunes can help you get regular, be wary of eating too many. “Assuming you’re eating other sources of fiber throughout your day, I wouldn’t go overboard,” Gorin says. “Too much fiber can cause cramping, which can be unpleasant to say the least.” No one wants that, so start with a handful of prunes and see how you feel before reaching for seconds. It’s a no brainer to grab a banana for a quick potassium fix, but go for prunes next time to keep things interesting. A serving contains around 290 mg of the heart-protecting mineral, used to keep our hearts and nerve responses functioning normally. Gorin and Bannan also note the fruit is rich in antioxidants like phenolic compounds (more than similar dried fruits like dates or raisins), which research has shown to decrease cardiovascular disease risk factors and lower blood pressure and total cholesterol in people who ate prunes on the daily. Remember when your mom would tell you to drink milk every night for strong bones? Maybe it should’ve been a nightly glass of prune juice. Turns out dried plums are a power player in the vitamin K game, “a key nutrient in the process of bone mineralization,” Bannan says. They’re also good sources of zinc, magnesium, potassium and boron, which she says help with bone formation, regulation, and structure—no bones about it. Gorin notes research that found eating a serving of prunes daily helped slow bone loss in postmenopausal women with low bone density. She recommends eating five to six prunes a day to reap the bone-healthy benefits. It’s easy to side-eye fresh and dried fruit for being high in sugar, but prunes stray from the pack a bit in this category. They contain 18 g of sugar, but the soluble fiber actually slows how quickly it is digested and absorbed, helping keep blood sugar levels from making a drastic jump. “If you’re eating prunes to help alleviate some constipation, then you want to eat—read: chew—your prunes, not drink them,” says Brigitte Zeitlin. This is because “prune juice, like all juice, does not have the fiber that eating the whole fruit or veg will give you,” she explains. “And fiber is what promotes motility and fights belly bloat.” Additionally, a serving of prune juice only contains 6 grams of sorbitol (remember, it’s largely this sugar alcohol you have to thank for prunes’ laxative effect), compared to 15 grams found in the whole fruit, according to the New York Times. If eliminating constipation isn’t your goal, Zeitlin still recommends you fill a bowl rather than a glass because most Americans currently aren’t getting enough fiber in their diet. Are there any downsides to eating a lot of prunes? “Give them a chance,” Bannan says. “They’re delicious, juicy, and sweet.” Besides popping them one by one into your mouth like candy (don’t get us wrong, it’s a simple and tasty way to snack), the versatile prune can power up dishes you already eat. Chop a few to garnish your go-to salad or side dish, or try a prune jam with onions for a sweet and savory option. To appease your sweet tooth, top a fruity breakfast pizza made with granola crust with a cup of prunes, prep a whipped chocolate chia pudding to store in the fridge for grab-and-go moments, or blend them into a smoothie. Gorin also recommends using pureed prunes in brownie batter (yes, really) to make the tray bake more moist and to bring its sugar content down a notch. Firmly seated on the prunes bandwagon? Read up on how to avoid bloat when eating a high-fiber diet. And if you need more recipe inspo, try adding prunes to one of these plant-based breakfasts.